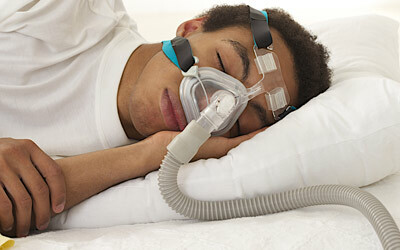 How Does a CPAP Mask Help with Sleep Disorders? Home > CPAP Machine Toronto > How Does a CPAP Mask Help with Sleep Disorders? If you or your partner has a sleep disorder such as insomnia or obstructive sleep apnea, a CPAP mask an effective treatment. It’s usually the recommended treatment by doctors and sleep specialists – especially if surgery is out of the question. With obstructive sleep apnea, it is difficult to breathe deeply during sleep, due to the upper airway passage being blocked by some obstruction. If the obstruction only causes partial blockage, the apnea is mild or moderate. If it causes full blockage, the problem is more severe and should be taken very seriously. Snoring is usually associated with sleep apnea. The mask comes in various sizes and shapes to suit a different faces. There are designs available for mouth breathers as well as nose breathers. How Does a CPAP Mask Work? The motor is a small compressor of sorts that draws in room temperature air and pressurizes it to deliver the amount of air pressure required to clear the obstruction. This amount is determined by a doctor or sleep specialist during an overnight sleep test. Some motors come with extra features such as built-in humidifiers to allow moisture to get into the air. Most motors are designed to operate quietly so that you won’t be disturbed in your sleep. The hose is self-explanatory. It’s what the air travels through when it leaves the machine. After running through the hose, the air goes through the mask and into the lungs. Hose diameters vary, just as the size of the mask. Lengthwise, most hoses re around 6 feet. How Does the CPAP Mask Help? This kind of breathing therapy helps patients get quality sleep for an entire night. Even if you only have a mild form of apnea, you can still benefit from a CPAP mask. If you ever feel the slightest bit sleep deprived, the mask provides numerous benefits. Sleep apnea prevents sufferers from sleeping deeply and fully. When there is an obstruction, you will wake up several times throughout the night gasping for air. You might not even remember the experience when you wake up. In milder cases, you might only wake up a few times. At most, you’ll go ten seconds or so without breathing any while you sleep. In more extreme cases, you could go a full minute without breathing before your brain finally sends signals telling you to wake up. When there is air pressure continuously being blown into your air passage, you won’t stop breathing any, or keep waking up. You’ll experience full, uninterrupted sleep for hours. Think of how much better you will feel physically and mentally when you wake up feeling refreshed and full of energy. If snoring is a problem, your partner will no longer be disturbed from it, since the therapy helps prevent snoring. CPAP masks also help prevent health conditions associated with sleep deprivation, such as chronic fatigue, cardiovascular diseases, and low blood pressure.